EQuIS™ (Environmental Quality Information Systems) is an advanced environmental data management and decision support system. Thousands of organizations use EQuIS to manage large amounts of data pertaining to environmental chemistry, biology, geology, geotechnical, hydrology, limnology, air, and associated compliance monitoring activities. EQuIS supports the complete environmental data workflow for a variety of project requirements including task management, field data collection, analytical data checking, data verification and validation, reporting, graphics, and visualization. EQuIS provides modules for different user types connected to the same SQL Server or Azure database. Several applications comprise the EQuIS workflow and are most powerful when used together. Brief definitions of various EQuIS applications and components are provided below. 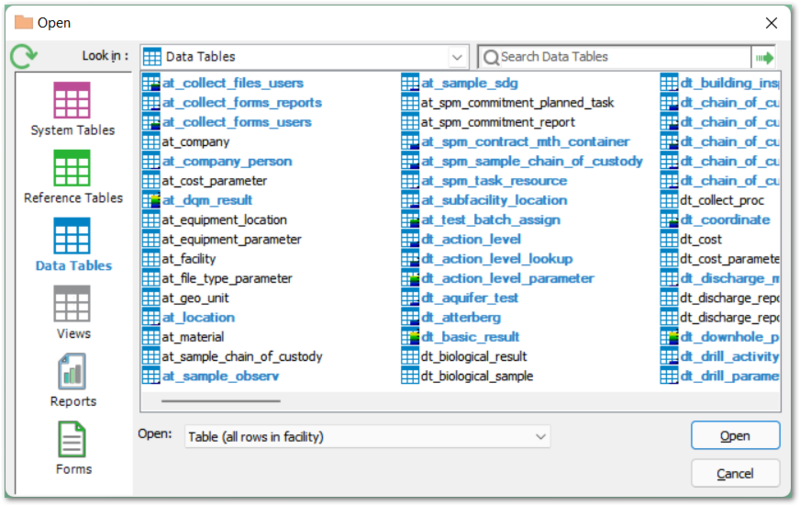 EQuIS Database – Customizable Schemas for environmental data management. Platform runs on Microsoft SQL Server or Microsoft Azure. Each EQuIS database may have one to thousands of projects. Professional – Desktop application designed for power-users and data managers. EQuIS Professional is used for data importing and editing, has tools for advanced data analysis and modeling, and provides ultimate power and flexibility. Enterprise – Web application typically used by managers, auditors, executives, and laboratories. EQuIS Enterprise connects to the same EQuIS database as EQuIS Professional, but provides simple, easy to use tools to view and analyze data and automate workflow. Gain overviews of projects in highly-configurable web dashboards, and download and visualize data instantly and in real-time. EQuIS Data Processor (EDP) – Desktop or web user interface for checking and importing data into the EQuIS database. Check data for formatting and logic, and find and correct errors easily. Sample Planning Module (SPM) – Desktop and web user interfaces for planning, scheduling and tracking field sampling events. Generate field Electronic Data Deliverable (EDD) templates, view and download calendars, and monitor the completeness of tasks within SPM. Collect – A mobile field application for collecting any type of data on a phone, tablet, or laptop. Custom forms to capture data can be created, published, and made immediately available to selected user groups in the field. Manage field data workflow using Collect Enterprise dashboards. Collect, verify, and enforce data quality in real time. 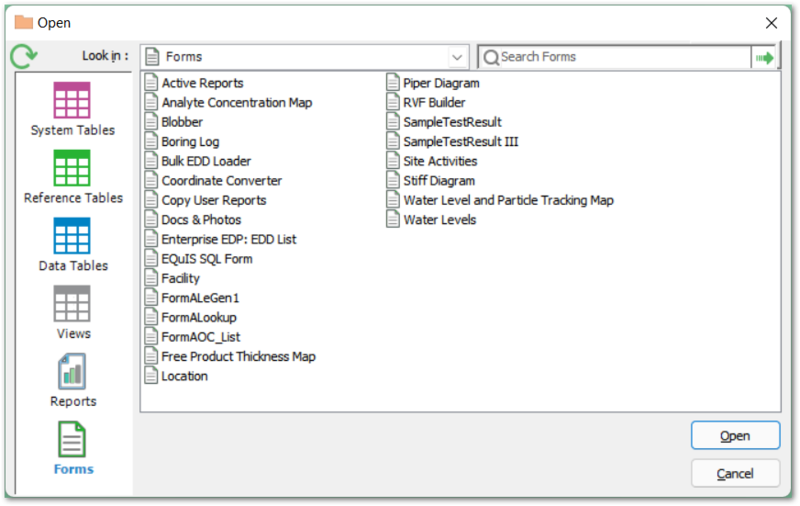 EQuIS Data Gathering Engine (EDGE) – Application installed on laptops or tablets for field data collection (samples, measurements and inspections) using configured forms. Import EDDs from SPM for planned events. Field data is checked as it is collected and may be submitted immediately to the EQuIS database. Data Qualification Module (DQM) – Review data quality based on defined criteria, setup and customize data checks and rules, and review previous history with DQM within EQuIS Professional. EnviroInsite – Desktop application that provides a toolkit for analysis and visualization of environmental data available with EQuIS. Create two-dimensional (2D) and three-dimensional (3D) plots, generate boring logs, evaluate geochemistry, and more. Live – EQuIS Live enables management of high-frequency, high-volume logger data in EQuIS Enterprise. EQuIS Live includes a separate Schema that is added to an EQuIS database and enables the collection and reporting of data coming from data loggers within the other EQuIS applications. Alive – Designed around ecological surveys, EQuIS Alive includes a separate Schema that is added to an EQuIS database and enables the collection and reporting of ecological data within the other EQuIS applications. LakeWatch – Collect, manage and report on limnological data. EQuIS LakeWatch includes a separate Schema that is added to an EQuIS database and the entire module is accessed within EQuIS Professional. Risk3T – Risk3T for EQuIS is an action level calculator. Risk3T evaluates default or site‐specific Risk‐Based Corrective Action (RBCA) levels for environmentally impacted sites, and generates site-specific multiple risk scenarios and corrective action goals. These risk levels can be loaded into EQuIS Action Level tables. Third Party Interfaces – Methods for generating output that may be displayed in non-EQuIS ("third party") applications, such as ArcGIS, AutoCAD, gINT and many more. Some interfaces connect EQuIS directly to the third party applications. Other interfaces generate output files within EQuIS Professional that may be opened in their respective applications. Familiarity with terminology used throughout the help files will be critical to understanding EQuIS. Relational Database – A relational database (RDB) uses data tables as a means of storing and retrieving information. Tables are organized as columns (fields) and rows (records). Data in a table can be related according to common keys or concepts. Relationships are a logical connection between different tables and are established based on the interaction among these tables. Well-defined relationships (a.k.a set of rules) between database tables can be established to enforce restrictions on the data. Tables communicate and share information, which facilitates data searchability, organization and reporting. Data can be sorted based on any field and reports can be generated that contain only certain fields from each record. RDBs typically use Structured Query Language (SQL) for querying and maintaining the database. EQuIS is a relational database. One-to-Many Relationships – Relationships in which a record in one database table can be related to many records in another database table. 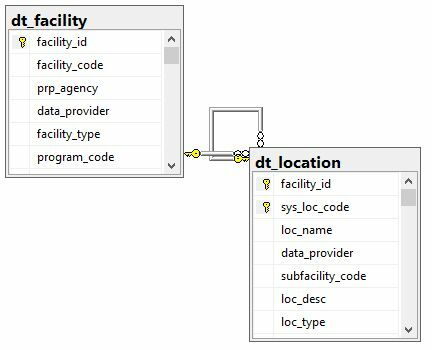 For example, there can be many sampling locations (SYS_LOC_CODE) within a single project site (FACILITY_ID). Many-to-Many Relationships – Relationship where more than one table record relates to more than one record in another table. For example, one person may be associated with more than one company OR one company may be associated with more than one person in the AT_COMPANY_PERSON table. Parent-Child Relationships – Rules that enforce organization in a database by requiring a record in a child table to have a corresponding record in a parent table. The structure allows repeating information using parent-child relationships—each parent can have many children but each child has only one parent. Primary Keys – Fields or sets of fields in a table that constitute a unique record within that table. 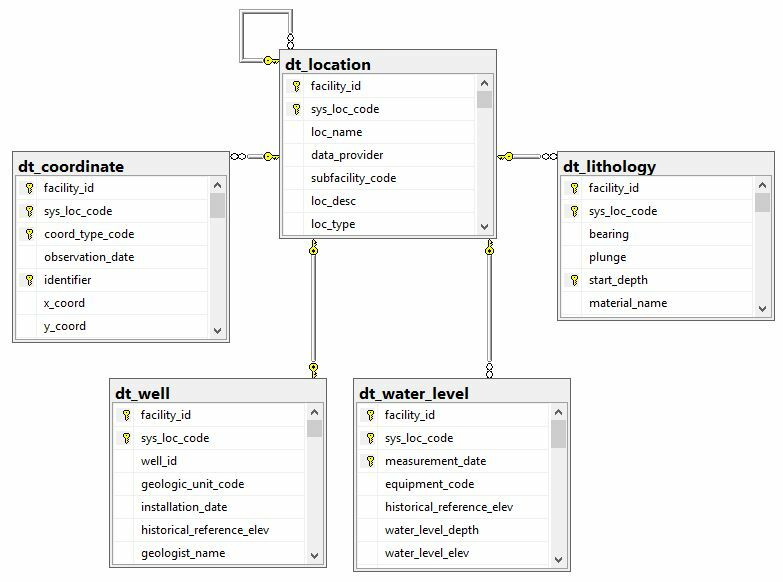 Primary keys within a database are used to define the relationships among the tables and are required. Thus, primary keys must be populated (not null) and unique. Referential Integrity – Relational databases follow certain integrity rules to ensure that the data they contain stays accurate and accessible. Referential Integrity is the collective set of rules that ensures consistent and valid data within the database, including primary keys, one-to-many relationships and parent-child relationships. Analyte – The substance being analyzed for or quantified by an analytical procedure. Many different names can be used to mean the same thing: Analyte, chemical, compound, constituent, contaminant, determinant, parameter, etc. CAS RN (Chemical Abstracts Service Registry Number) – The CAS RN, often referred to as the "CAS number", is a unique identifier assigned by the Chemical Abstracts Service to chemical substances. There is only one identifier per substance. The registry designation serves as a link to a wealth of information about a specific chemical substance. EDD (Electronic Data Deliverable) – EDDs are electronic tabular formats for sharing, manipulating and using data. Access databases, Excel spreadsheets, and tab delimited text files are all examples of EDDs. Data Tables – Data tables contain information acquired from, derived from, or describing some part of a specific project (i.e., facility). These tables include a wide variety of chemistry, geology, hydrology, limnology, and geotechnical data. The size of these tables increases over the course of a project as new data is loaded into the EQuIS database. Data tables are designated by the prefix DT_ (e.g., DT_SAMPLE). Reference Tables – Reference tables contain lists of reference values, valid values, or look-up values. The values include lists of units, coordinate types, analytes, CAS numbers, matrices, analytical methods, etc. These values are typically defined at the beginning of a project by the project administrator(s). Each EQuIS database has only one set of reference values for all of the facilities in that database. Reference tables are designated by the prefix RT_ (e.g., rt_analyte). Reference values are frequently provided in EQuIS applications as pull-down lists. Requiring selection from a list (rather than open text entry) ensures consistency in spelling, which ensures consistency in data. 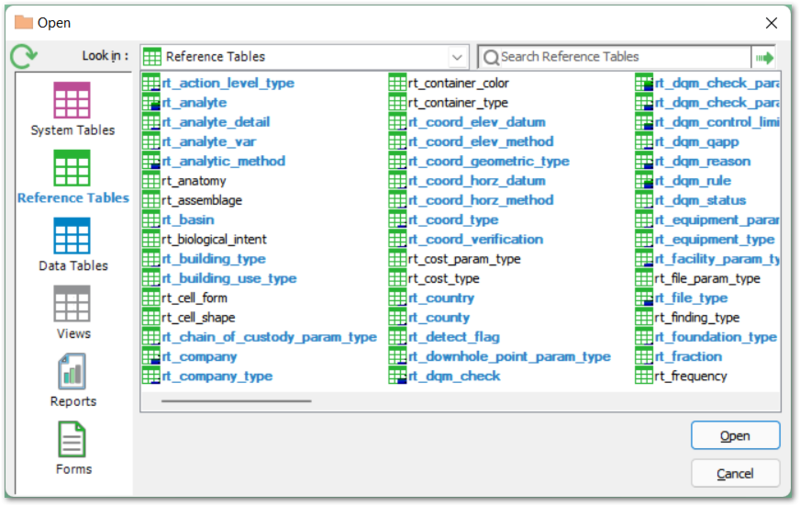 In EQuIS Professional, reference values are found in individual reference tables within the database. In EDP Standalone and EDGE, reference values are accessed via a (*.rvf) reference value file. Associative Tables – Associative tables contain data representing associations (i.e., many-to-many relationships) between items in data tables. Associate tables are designated by the prefix AT_ (e.g., AT_COMPANY). 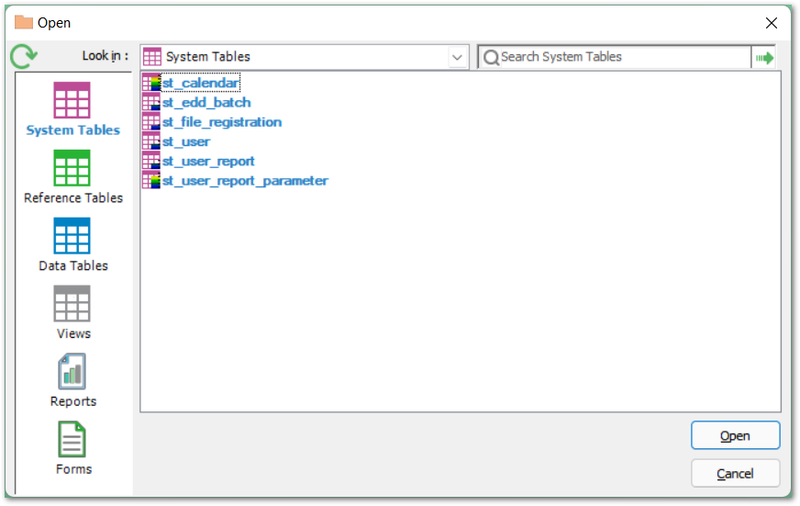 System Tables – System tables contain information managed by the EQuIS application. Records in these tables should not be altered. System tables are designated by the prefix ST_ (e.g., ST_LICENSE). 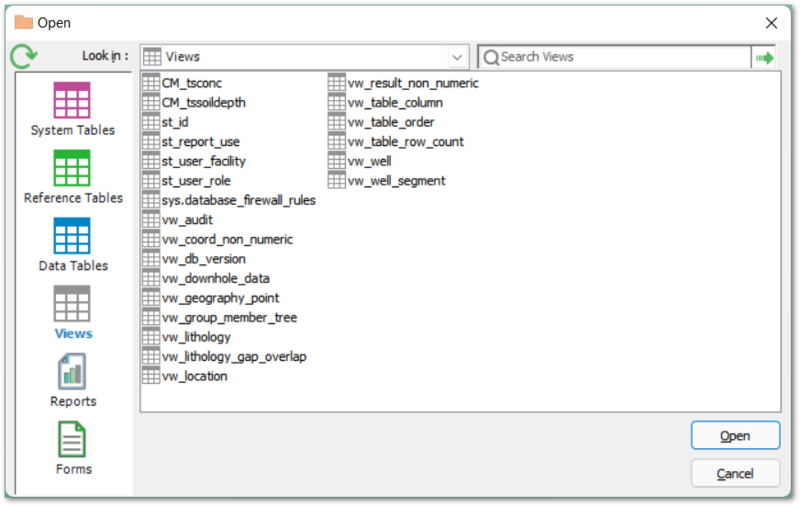 Views – Views display data combined from multiple tables. Views are designated by the prefix VW_. 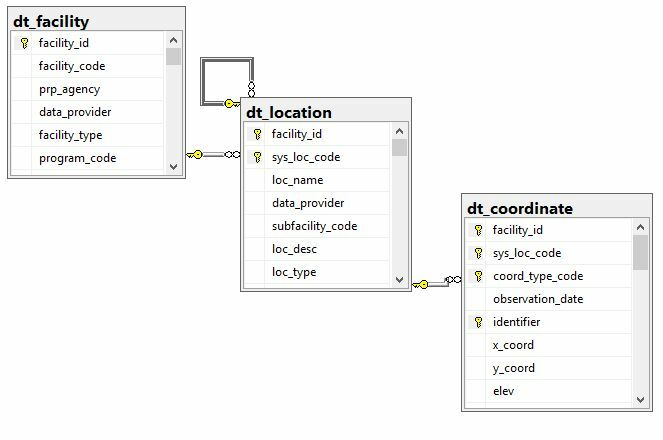 For example, VW_LOCATION combines data from DT_LOCATION with DT_COORDINATE. Reports – Query of EQuIS Schema to present data in a tabular, crosstab, or formatted output. Forms – Forms provide a convenient method of viewing and interacting with EQuIS data. Facilities – The physical (site) or logical (project) extent of data made available for reporting or modeling. Each facility is stored in EQuIS as a FACILITY_ID. Locations – Uniquely designated sampling points, typically on the ground surface, that can be identified spatially by X, Y and Z coordinates. Each location is stored in EQuIS as a SYS_LOC_CODE. Location Group – User-defined collection of locations for reporting and graphing. For example, all of the groundwater monitoring wells in a designated section of a facility may be added to a discreet location group. 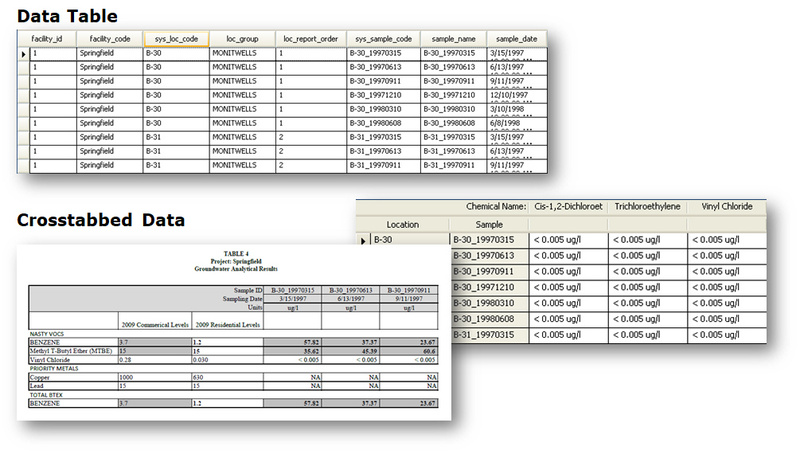 Analyte Group – User-defined collection of analytes for reporting and graphing. For example, all the volatile constituents being sampled at a site may be added to one analyte group while all of the semi-volatile constituents are added to a different analyte group. 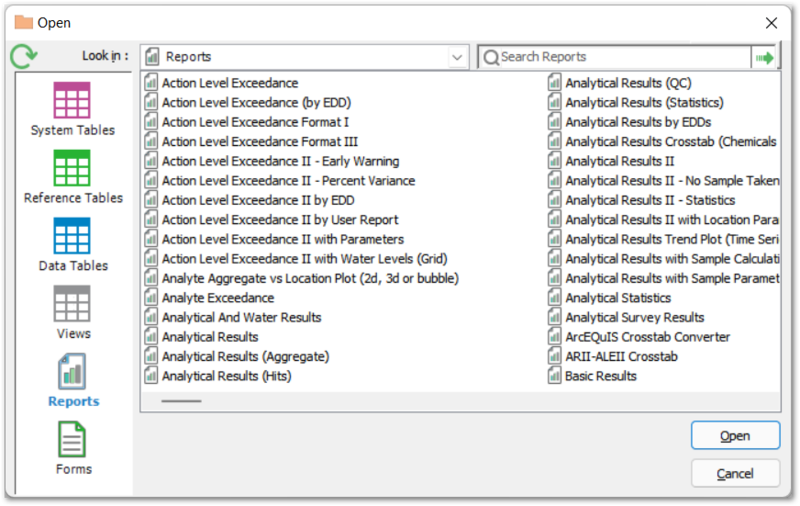 Action Levels – Values against which analytical results or parameter measurements are compared when reporting in EQuIS. Action levels may also be referred to as standards, comparison criteria, cleanup levels, etc. Crosstab Reports – Crosstab reports are an EQuIS tool that enables the reorganization and summary of data into an easier-to-understand format with column headers, row headers and tabbed data. A Crosstab report does not change the data in the EQuIS database.